Anxiety is at an all time high, but there's a prescription for dealing with it. 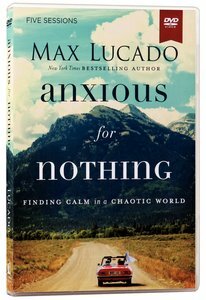 In this 6-session DVD-based study, Max Lucado invites viewers into an exploration of Philippians 4:6-8 "be anxious for nothing", and helps them to discover the true peace of God "which surpasses all understanding". About "Anxious For Nothing (A Dvd Study)"
We are tense. Why? Change is one reason. Sociologists speculate the world has changed more in the last thirty years than it has in the last three hundred! Every day seems to bring new change and threats. We also face personal challenges-job loss, cancer, divorce, addiction, bankruptcy. Add to personal challenges those of a global nature imported into our lives every few seconds thanks to smart phones, TVs, and computer screens. In our parents' day, the nightly news caught them up on world events. Now it is a matter of minutes. Anxiety just comes with life. However, as God's Word reveals, it doesn't have to dominate life. In this six-session video-based Bible study, bestselling author Max Lucado looks at seven admonitions from the apostle Paul in Philippians 4:4-8 that lead to one wonderful promise: "The peace of God which surpasses all understanding." As he unpacks each verse, he shows how God is ready to give comfort to help us face the calamities in life, view bad news through the lens of sovereignty, discern the lies of Satan, and tell ourselves the truth. We can be anxious for nothing, and discover true peace from God that surpasses all human understanding. Customer Reviews For "Anxious For Nothing (A Dvd Study)"